Does My Water Heater Need an Expansion Tank? If your home has a “closed” plumbing system, then yes, you’ll need an expansion tank. You see, homes have either an open or a closed plumbing system. A closed plumbing system prevents water from flowing in the reverse direction (i.e., water won’t flow back into city lines once it enters your home’s pipes). Since most new homes are built with a closed plumbing system, chances are, you’ll need an expansion tank. We’ll explain why below. Need a plumber to install an expansion tank for your water heater? An expansion tank will prevent damage to your water heater and plumbing system. Like we mentioned in the beginning, a closed system creates a single path for water to flow into (but not back out of) your home. However, when water is heated, its volume expands (this is called thermal expansion). When the water volume expands, it puts extra pressure on the tank. Over time, after continuous expanding and contracting, the tank will weaken (think of bending a paper clip back and forth—eventually it will break). And that’s where an expansion tank comes in. When you install an expansion tank, the extra water volume created by thermal expansion automatically rushes into the expansion tank, reducing the pressure inside your water heater. Because it reduces pressure, an expansion tank prolongs the life of your water heater. In fact, some manufacturers may void your water heater warranty if you have a closed plumbing system without an expansion tank. Now that you know why you need an expansion tank, let’s look at how to tell if you have a closed plumbing system. 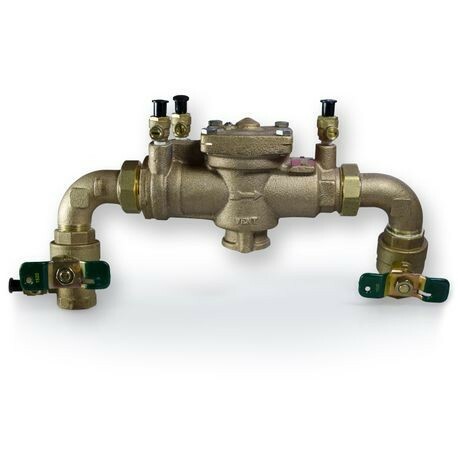 If you see a backflow prevention device (like a check valve or pressure-reducing valve) connected to your main water shutoff valve, then you have a closed plumbing system. Note: Backflow prevention devices can vary by design, but most will look similar to a device like this. If you’re having trouble locating your main water shutoff valve, or you can’t identify a backflow prevention device, contact a plumber. They’ll tell you if you have an open or closed system, and can provide expansion tank recommendations. How Long Does It Take a Water Heater to Recover? Looking for Red Cap AC Services?